The genesis of this project actually starts with what eventually became opus 9. The general idea and visual design of the organ were already laid out when other issues necessitated postponing St. Bede’s contract. Instead, we moved forward to place an organ here in Chattanooga near our shop. 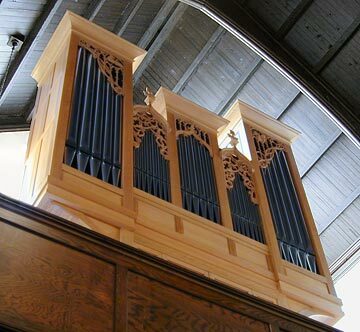 Church organist Karla Fowkes (wife of Bruce Fowkes) helped plan this project and played the dedicatory recital in 1998. Our instrument in the rear gallery replaces a Moller Artiste that had been relocated some years prior from an Episcopal church in Dalton, GA. The sanctuary of this 250 seat church was redesigned by Ralph Adams Cram in the late 1920s, though the bell tower was never built as planned. It is, however, a sacred space with warm acoustics which are ideal for organ, vocal, and instrumental music. Visually, the instrument is loosely based on the famous (now destroyed) Totentanzorgel in the Marienkirche, Lubeck, Germany. This small but complete two manual instrument places the Werk on the main impost and a smaller Brustwerk below it directly above the keydesk.